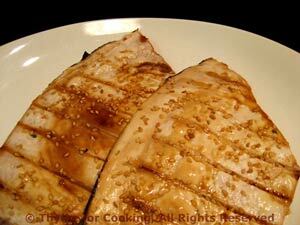 Grilled Teriyaki Swordfish, quick, easy gourmet dinner. It's not often that I can get the 'larger' ocean fish, here, like tuna or sword fish, but they work so nicely on the grill I always snap them up during the summer. The steaks we had were quite thin, about 1/3" (1cm). They cooked very quickly on the grill, about 2 minutes per side. If you prefer, you can quickly pan-fry them for about the same amount of time. We use a grill basket for fish; it makes it easier to handle the filets or steaks. You could also use a silicone mat - but no grill marks! Lightly oil fish basket or grill. Brush 1 tbs Teriyaki sauce on swordfish. Place in oiled fish basket or on oiled grill rack over direct heat. Cook 2-4 minutes per side, depending on thickness, turning once, or just until done. Do not over cook! The fish should flake easily and be opaque, but overcooking will dry it out. Remove. 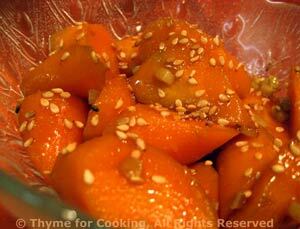 Pour remaining 1 tbs Teriyaki sauce over the top, sprinkle with sesame seeds and serve. Peanut butter, sherry, fresh herbs... It's a simple sauce, rich, creamy and full of flavor. It is meant to be served just barely warm or at room temperature. In a small saucepan heat chicken stock, peanut butter, soy sauce and sherry, just until peanut butter melts, stirring well to combine. When pasta is done, drain well and put into a bowl. Immediately pour sauce over and stir well to combine. Add herbs, stir well and serve. 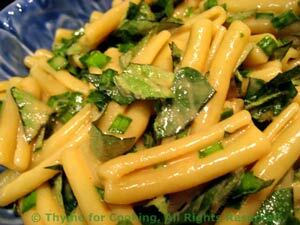 Note: If using dried herbs add to sauce when heating.